Acne (medical name Acne Vulgaris) is a common condition, especially among adolescents and young adults and contrary to what some people believe, is usually very treatable. Although the causes of acne can range from hormones and diet, to stress and infections, research has shown that some people are genetically more susceptible to this sometimes disfiguring and embarrassing skin disease than others. It actually develops as a result of blockages in the follicles, usually on the face, but sometimes spreading further onto the neck, shoulders, chest and back. 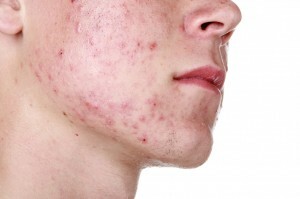 During adolescence, acne is commonly caused by an increase in hormones such as testosterone, which occurs during puberty in both males and females. The skin changes are caused by changes in skin structures consisting of a hair follicle and sebaceous gland – changes that require hormone stimulation. Although acne affects 80 – 90% of teenagers, it is estimated that about nearly 3 in 10 experience inflammatory acne bad enough to need treatment to prevent longer-term scarring. Untreated acne usually lasts about 4-5 years before subsiding, though it can last for many years in some cases. This organic compound is the active component of most acne cream medications and it has a three-pronged approach in treating acne: it kills the P. acnes bacteria; it reduces inflammation; and it helps to clear blocked pores. Benzoyl peroxide is available at pharmacies, without a prescription and it comes in different brand names and strengths, usually ranging from 2.5% to 10% strength. Topical retinoids work by reducing the production of sebum (an oily or waxy substance produced by the sebaceous glands in the skin) while preventing dead skin cells plugging hair follicles. These include tretinoin, adapalene and tazarotene and are available as gels or creams to be applied once a day before bed. As with benzoyl peroxide, skin should be prepared using a mild water-based preparation and retinoids can cause skin irritation and sensitivity to sunlight. A typical treatment course is 6-8 weeks, but it is often advisable to continue using the medication less frequently after this to keep acne at bay. While these have little effect in unblocking pores, they help to kill bacteria on the skin and reduce inflammation and are available as a lotion or gel that is applied once or twice a day. They tend to have fewer side effects than other topical treatments, so are usually prescribed for men with less severe acne, or men who have less of a problem with blackheads and/or whiteheads. This is an alternative that mainly works by unplugging blocked pores and if often prescribed for patients who are experiencing particularly irritating or painful side effects of topical treatments such as benzoyl peroxide or retinoids. As with other topical treatments, azelaic acid will need to be applied daily for at least a month before noticeable results are seen and daily application for six months is the normal recommended course of treatment. Aside from topical treatments, antibiotic tablets can be effective in treating more severe cases of acne in men and they work by killing the P. acnes bacteria and reducing the resulting inflammation caused by the bacteria. For patients that have a lot of blackheads and whiteheads as well as inflamed acne spots, it is usually advisable to use a topical treatment in addition to taking an antibiotic tablet for optimum results. Because of these potential side-effects, blood tests are necessary before and during treatment. As with antibiotics, isotretinoin tablets are only available with a prescription. It is important to expect that acne will flare up again if treatments are stopped. They key aim of acne treatments is two-fold: to reduce the visible signs of acne during treatment and; to reduce or eliminate long-term scarring that often result in cases of more severe, untreated or mistreated acne. 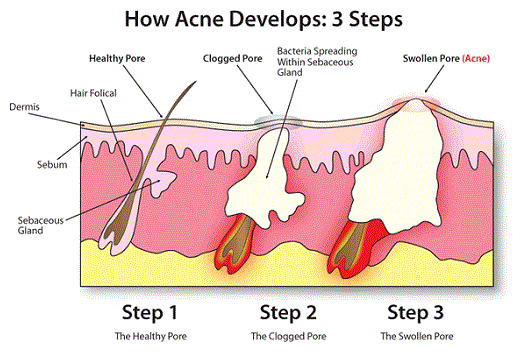 As mentioned earlier in this article, acne usually lasts about 4-5 years before subsiding. This means that treatment is usually required for a similar period of time, though the chosen treatment methods will usually change over that period of time. For example, long-term use of antibiotics can lead to resistance of bacteria to the antibiotics, so antibiotic treatments are usually stopped and replaced with other methods once the worst of the spots have cleared. Also, azelaic acid is only licensed for treatment for a limited period of time (six months in most countries). Regardless of the severity of acne, they key is to take appropriate action early so that symptoms can be treated and any longer-term affects on the skin are eliminated or at least kept to an absolute minimum. Observing the things to avoid such as a diet high in sugar and carbohydrates and keeping the skin clean are a good place to start and then choosing the rigt course of treatment will help to ensure that the immediate and longer-term effects will have minimal impact on this often self-image impacting condition. Though milder cases of acne can be treated with over-the-counter medications, as with all medical conditions, it is advisable to seek the advice of a doctor.